I have always wanted to run. So walking to build strength and endurance back in April 2012 was the first step to get me to run. Being out of shape for so long I would joke that the only way I would RUN is if I was chased by zombies. Well folks guess what? 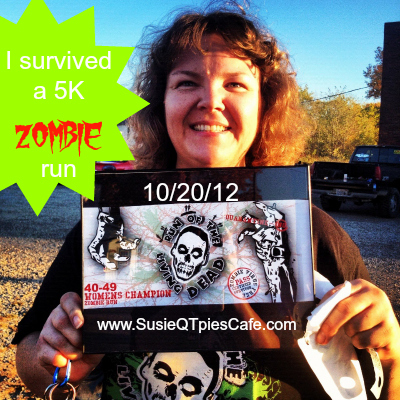 My first 5K last October 2012 was a Zombie Run! So I had to run from zombies! It was scary and hilarious all rolled up in one hour! 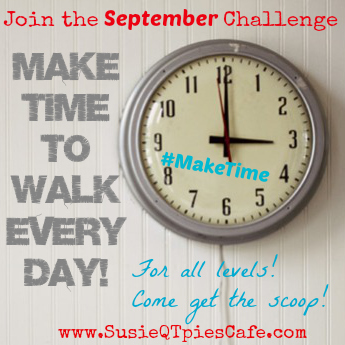 Join our September Challenge and our healthier lifestyle journey by reading more below and following the other post in the series! I wasn't ready to run a 5K when I signed up. I could walk fast but still got short of breath running. So to sign up and sprint run, I was crazy to do it but it felt so good afterwards. I talked a group of teens and a few adults to join in with me. I ended up getting 1st place in my AGE group which was totally hilarious. Today on Day 9 I just want to challenge you to think about your long term goals. You might want to walk a 5K or even run a 5K (3.2 miles) or you might not. Maybe you just want to walk for 30 minutes without stopping. Maybe long term you want to be able to keep up with the grandkids without being in pain. Maybe you want to drop some weight, eat healthier and fit into some smaller clothes. Whatever it is start thinking about it. Let yourself start thinking ahead. Today I'm sharing with you a post from Keep Moving Forward with Me on 5K Tips and Tricks and a few tips and tricks of mine. 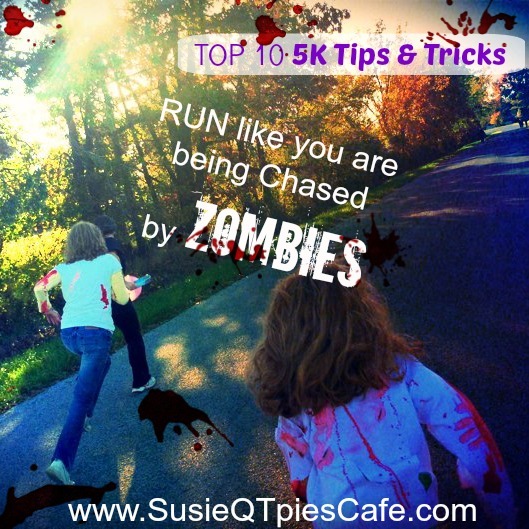 Pop over to her blog and get more tips on her first 5K advice. I learned a few things from her! 1-Sign up for a race 2 months in advance. This will give you time to get some endurance and follow a 5K app plan. 2-Try and check out the map before you run to familiarize yourself or just visualize what you will be doing. Sometimes you will get this before the day of the race. 3-Stretch a good 15-20 minutes before your run. 4-Breath in and out during your runs as your left foot hits the ground. THANK YOU Taralyn for this tip. I have struggled with finding a good time to breath when running and will try this out ASAP! 5-Don't worry about people passing you up. Just set your pace and take off! 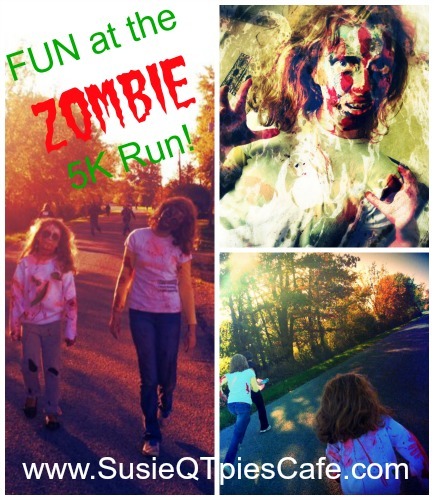 Do RUN as fast as you can if you are getting chased by zombies! 6- Races are serious business but try hard and let yourself enjoy it. They can be very competitive for some and others are just running to run for the fun of it. You can do both but if it is your first one try and run for the experience. 7-Whatever clothes, shoes and music you listen to when training, do that for your actual 5K. Why? I find that it is what you are most comfortable in and the music sets your pace. 9-Take a before and after race photo. 10-Tell EVERYONE you are going to be in your 1st 5K. People love supporting this and you might even inspire others to join in.